Transportation accidents can result from any form of air, rail, water, or road travel. These incidents are collectively the costliest of all hazards in the Commonwealth in terms of lives lost, injuries, and economic losses. Pennsylvania has the fifth largest state highway system in the United States, consisting of 119,000 linear miles of roadway and 31,800 bridges (Federal Highway Administration, 2017). 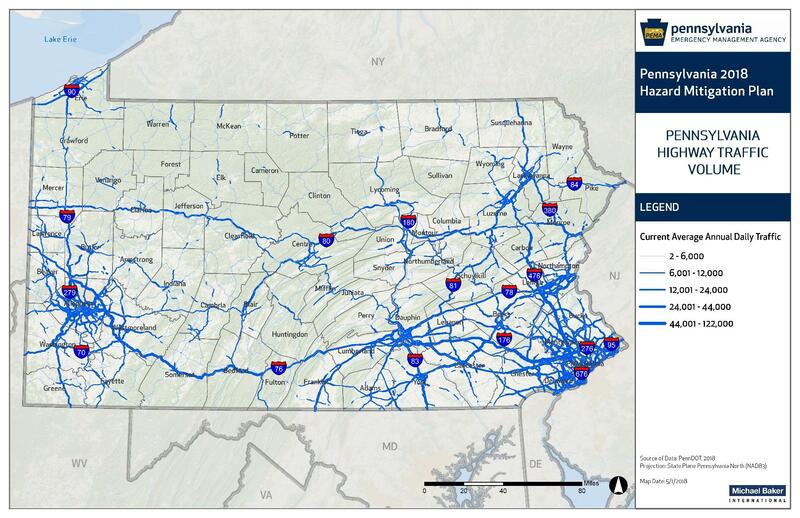 Daily vehicle miles traveled on the Pennsylvania highway system is 276,966,605; 66% of this total occurs in urban areas while 34% occurs in rural areas (PennDOT, 2016). The sheer amount of roadway coupled with the high volume of traffic creates the potential for serious accidents along the Commonwealth’s roads and bridges. Rail accidents can occur anywhere along the more than 5,000 linear miles of track with more than 50 railroad companies operating in Pennsylvania (PennDOT, 2016b). In 2016, there were 129,395 reportable crashes (a 1.8% increase over 2015) resulting in 1,188 deaths (a 1.0% decrease from 2015) and 82,971 injuries (an increase of 1.2% from 2011), with an average of 355 reportable crashes daily. Aviation accidents are the least frequent type of transportation accident; from 2006-2017, there were 364 air transportation accidents in Pennsylvania. From 2014-2017, there were 296 rail incidents in the Commonwealth resulting in a total of 382 injuries and 11 deaths, including the deadly Amtrak derailment in Philadelphia that occurred in May of 2015 and led to the death of 8 passengers, 241 injuries, and over $30 million in damages. The worst transportation accident on record occurred in May 1998 when a tanker carrying gasoline exploded on Interstate 95 in Delaware County, causing two deaths and significant damage. The fire was so hot that it buckled the bridge girders and forced months of repairs. It is unlikely that small accidents would significantly impact the larger community. However, certain accidents could have secondary regional impacts such as a hazardous materials release or disruption in critical supply/access routes, especially if vital transportation corridors or junctions are present. (Research and Innovative Technology Administration, 2009). Traffic congestion in certain circumstances can also be hazardous. Traffic congestion is a condition that occurs when traffic demand approaches or exceeds the available capacity of the road network. This hazard should be carefully evaluated during emergency planning since it is a key factor in timely disaster or hazard response, especially in areas with high population density. (Federal Highway Administration, 2009). With the volume of goods and people moving through Pennsylvania, transportation accidents will continue to occur routinely, especially passenger vehicle accidents. In the case of highway accidents, PennDOT has taken great strides to reduce the number of highway transportation accidents through programs such as the Pennsylvania Highway Safety Corridor.